The Classic Belvedere Sunrise is quite theatrical where different elements of nature come together in a choreographed routine to create an artistic masterpiece. With the chiming bell tower in the background, the blanket of darkness is slowly lifted and the audience are greeted with early morning mist adding drama to this open air arena. The blowing wind adds a touch of freshness to the scene while meticulously shaping the low lying fog, playing peek-a-boo with everyone eager to soak in the lovely view. Just when it feels we have seen a magical display,lo and behold, the sun decides to sneak up from behind the mountains to paint the sky above the cozy town of San Quirico. 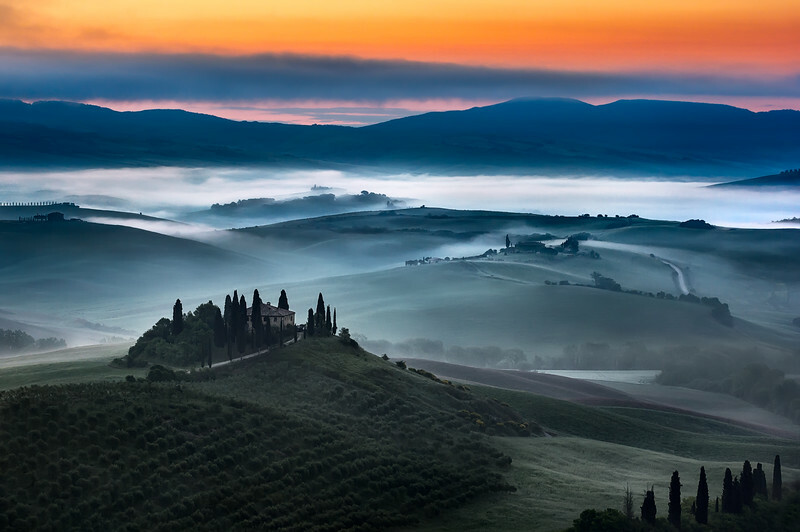 The climax begins with a tug of war and eventually the sun forces the fog to recede in the crevices of the tuscan valley allowing Belvedere to rule the center stage. Slowly the crowd disperses but the farmhouse stands tall to mesmerize the next set of visitors the following morning and the story goes on.